Zakat Foundation of America Community Center–Chicago (ZFCCC) at 1759 East 75th Street will host the first of its 2013 Laughter for Stress Reduction Health Fair series on Sunday April 21st from 9:00 a.m. to 2:00 p.m. Residents of Chicago and the surrounding suburbs are invited for a day of learning, sharing, health screenings and stress-relieving laughter in Chicago’s South Shore neighborhood. Laughter boosts immunity, lowers stress hormones and decreases pain. In honor of Humor Awareness Month, this ZFCCC Health Fair will show participants the lighter side of getting healthy by incorporating more laughter into life. Participants will also have the opportunity to learn from health professionals on a variety of health issues and subjects, share skills and talents through networking, receive free blood pressure and glucose screenings, and receive health related printed materials. Bring a healthy recipe to share, or take home a new one after enjoying complimentary healthy refreshments. Many illnesses are related to stress: heart disease, asthma, obesity, diabetes, headaches, depression and anxiety, gastrointestinal problems, alzheimers, accelerated aging and premature death. So use Laughter for Stress Reduction! 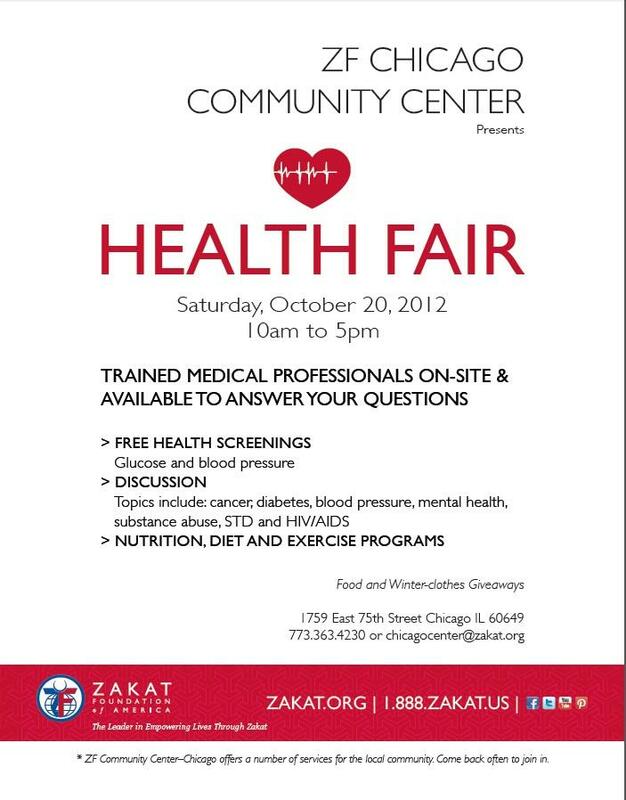 For more information email us chicagocenter@zakat.org.